Whether one is bullish or bearish on equities at any particular time, it is important to read and evaluate opinions that are contrary to ones own. In a recent WealthTrack interview Trahan, voted the #1 portfolio strategist in 10 out of the last 11 years by Institutional Investor Magazine, conducted with Consuelo Mack, François Trahan provides his reasoning for his fairly bearish view on stocks in 2017. He states the BREXIT inspired pullback was a gift for equity investors. He believes the recent market run up has been predicated on the positive economic data reported throughout the summer months. He does agree the move higher after the election is partly based on anticipated Trump policies. However, he believes much of what a Trump administration is proposing will not work its way into the economy right away, i.e., tax cuts, infrastructure spending, etc. I would say we agree on this as well. 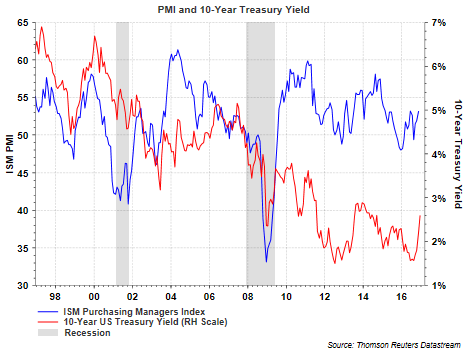 Trahan's negative view on equities seems grounded in the impact of higher interest rates and broadly a tighter monetary policy. He believes higher interest rates will result in P/E multiple contraction. He notes the inverse correlation of interest rates to P/Es. He believes PMIs are about as good as they will get, not only in the U.S. but globally. Below is the link to his interview. Following the interview I include some charts highlighting some of the economic data points he mentions in his conversation with Consuelo Mack. 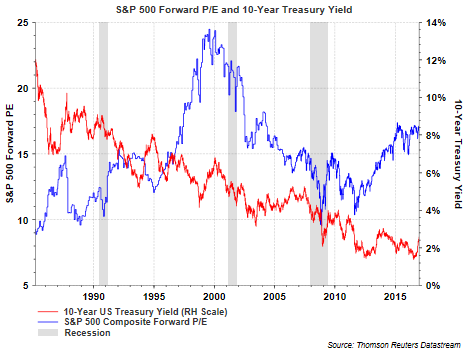 As it relates to P/Es and yields, a strong inverse correlation is present from the mid 1980's to the technology bubble top in 2000. However, from 2000 to 2013 lower rates led to lower multiples until multiples began to expand into 2015. In a few prior blog posts I have highlighted the fact equities can perform well when rates are rising from a level below 5%. 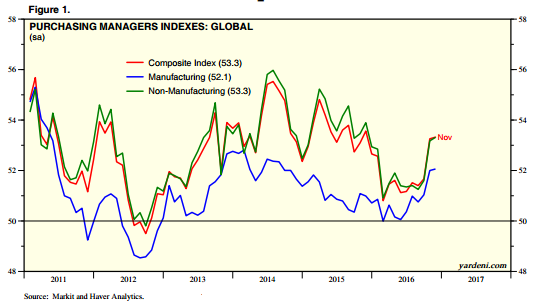 He also notes in the interview that global PMIs may be near peaking. I believe further improvement in PMIs has a high probability of occurring in 2017. He notes the excess capacity in many countries around the world is problematic and a symptom of these countries lack of domestic demand. For these countries to grow their own economy, exports are a important and he believes demand will lessen in import driven markets. So, whether you are bullish or bearish, Trahan's perspective is important to evaluate. The market has experienced a strong spike higher subsequent to the election and maybe some of Trahan's insight provides perspective on areas that are trading at an extended valuation, even if on a short term basis.